The architecture standardized by oneM2M defines an IoT Service Layer, i.e. a software Middleware sitting between processing / communication hardware and IoT applications providing a rich set of functions needed by many IoT applications. oneM2M’s Service Layer is typically implemented as a software layer and sits between IoT applications and processing or communication hardware and operating system elements that provide data storage, processing and transport, normally riding on top of IP. However, non-IP transports are also supported via interworking proxies. The oneM2M Service Layer provides commonly needed functions for IoT applications across different industry segments. oneM2M defines a horizontal architecture providing common services functions that enable applications in multiple domains, using a common framework and uniform APIs. Using these standardized APIs make it much simpler for M2M/IoT solution providers to cope with complex and heterogeneous connectivity choices by abstracting out the details of using underlying network technologies, underlying transport protocols and data serialization. This is all handled by the oneM2M Service Layer without a need for the programmer to become an expert in each of these layers. Therefore, the application developer can focus on the process / business logic of the use case to be implemented and does not need to worry about how exactly the underlying layers work. This is very much like writing a file to a file system without worrying how hard disks and their interfaces actually work. Therefore, the IoT Service Layer specified in oneM2M can be understood as a distributed operating system for IoT providing uniform APIs to IoT applications in a similar way as a mobile OS does for the smart phone eco system. For example, the following “vertical” domains are isolated silos which makes it difficult to exchange data between each other. Using a “horizontal” architecture allows the providion of a seamless interaction between applications and devices. In the below use case, a security application detects that when noboby is in the building, it triggers the switching off of the light and it stops the air conditioning. 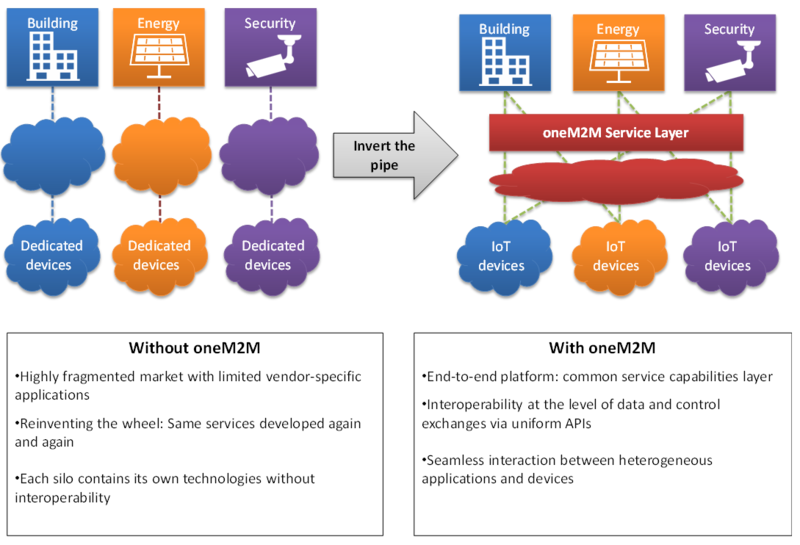 oneM2M’s Service Layer corresponds to a software “framework”, located between the IoT applications and communication HW/SW that provide storage/connectivity/data transport. It is like an Operating System for the Internet of Things, sitting on field devices/sensors, gateways and in servers. And, it is a standard – not controlled by a single private company.